A Kyororo is a one-eyed enemy from Super Mario Land 2: 6 Golden Coins that appears in the second stage of the Pumpkin Zone and usually wait in open spaces, repeatedly looking back and forth. If one spots Mario, they will charge at him full speed. Kyororo can be defeated simply by jumping on their heads or shooting a fireball at them, but jumping on them can be difficult due to their speed. The Kyororo, along with many other enemies in the Pumpkin Zone, are based on monsters from Japanese folklore. 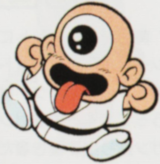 The Kyororo comes from Hitotsume Kozoo (one-eyed boys), troublesome one-eyed boys with large tongues that are said to run around frightening people. Kyororo From 「キョロキョロ」 kyorokyoro, Japanese onomatopoeia for glancing left and right repeatedly.